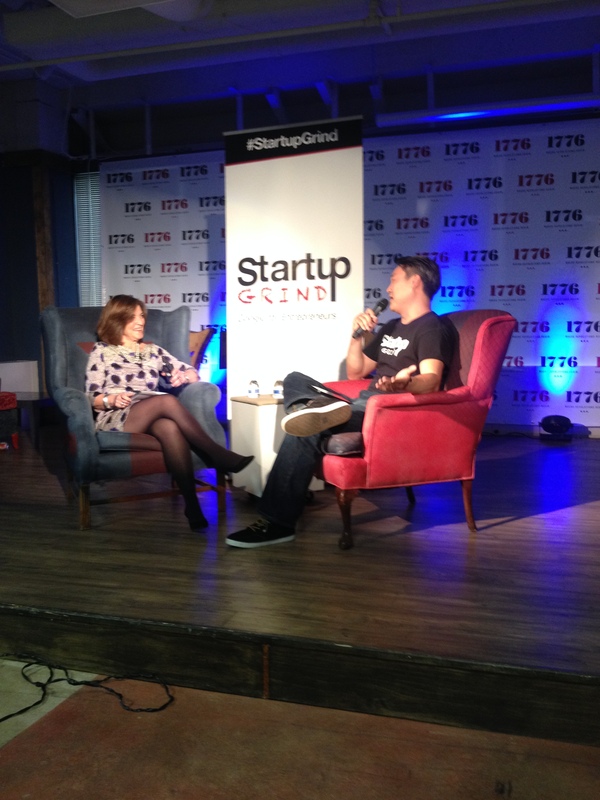 Sunlight Foundation Executive Director, Ellen Miller speaks with Brian Park at Startup Grind DC on April 21, 2014.
Who can manage without measuring? Who can lead without direction? How can we fix the government without access to good, open government data? Startup Grind DC featured guest, Ellen Miller, executive director of the Sunlight Foundation, has dedicated her career to public interest organizations that work closely with the highest levels of U.S. government. The former publisher of online progressive journal, TomPaine.org, a serial public interest organization founder and a believer that up-to-date, reasonably accurate data is needed to hold the U.S. government accountable for its actions. Good information tells its own story. It’s what gets project managers, citizens and journalists started on investigative reporting activities in areas that seem to warrant attention. Making available the right information to the public gives people a voice and helps keep our democracy on track. “Everyone is aware of the power of open data,” says Ben Reich, co-founder of datasembly.com, a startup dedicated to “unlocking the power of social data” by getting past the meta-level to link more actual content. That takes a ton of automated indexing. Ben had come to Startup Grind DC when he’d heard about the Sunlight Foundation’s mission for greater government data transparency. Ben and his co-founder Dan Gallagher have spent years working at big data software/business analytics sites and say they are out to unlock the power of social data. Making information more readily searchable increases the opportunity to discover information that previously seemed unrelated information. “People are struggling to find open data sets and correlate them effectively,” he observes. As this relates to accountable government, good data tells its own story, what’s going well, what’s not and – here’s the part Ellen Miller is keen on — what political money buys, specifically. It’s a small town. And so is Louisville. Ellen is from a conservative family. She’s a mix of her roots in Louisville, Kentucky, and raised on good and civil conversation. Capitol Hill culture and the art of political persuasion came later. Ellen is comfortable speaking on her feet. It’s plain to see she has spent time in the halls of power. First, to make the government do what it doesn’t want to do – information is power. Second, to engage citizens who have become cynical. History is made up of things that changed because people set their minds to changing them. And, as AOL founder, DC political presence, Steve Case likes to point out, American itself was a startup. She’s one of those people who will lead a discussion with the phrase, “I’ll tell you an interesting story.” Fortunately, she’s got a ton. Ellen is part of a breed of progressive, yet personally conservative, Washington careerists steeped in 1960’s political activism. Starting Sunlight Foundation wasn’t in her long-term plan. She started work as a 22-year old intern working for Ralph Nader at $50 per week. She wasn’t thrilled with how he treated the people who worked hard for him. It was a good nudge for her to create her own environment that supported exploring and testing a series of new project ideas. Public interest work, people skills, Capitol Hill know-how, intelligence and a sense of fairness made Ellen Miller a good candidate to lead a foundation. She’d worked in DC since graduating from college in the public interest space and had the opportunity to run two public interest organizations. As founding director for the Center for Responsive Politics for about 14 years (1983-1997) she is exceptionally proud of the organization’s creating OpenSecrets.org, the premiere organization for crunching numbers about money and politics. The relationship between money and politics was eye opening. She also founded the Public Campaign, an advocacy group for public financing of elections. She was happily serving as publisher for a progressive online publication, TomPaine.com when she was approached by Washington DC lawyer and philanthropist, Mike Klein, to discuss it over lunch. Mike ended up providing $3.5 million of seed funding for a foundation to keep the relationship between money and politics transparent and thereby uncover or deter political impropriety and corruption. We talked to a lot of people who were doing political reporting. They said, let’s take it to the most basic level. If data on political finance and lobbying and what they get from that – government grants, contracts, positions, advisory committees, whether anyone had been sanctioned by the EPA and on and on … if that information were more accessible, we could certainly convince our editors we had a story. Ellen was inspired by speaking with friends at the Personal Democracy Forum in New York City. “They had been studying the relationship of technology and politics,” Ellen explains. “Mike Klein and I were more interested in technology and governance. She hired a team to create, test and keep projects that support their mission to shed light on the role of money, lobbying, politics and what it buys. Currently, Ellen says, apps and tools are just a bonus. The data Sunlight is serving is the most important thing it does — Its APIs are used over 1 billion times. Open states, a community-based project with 100K – 110K users a month. Volunteer developers scrape their state legislative sites to be put into a common data format so you don’t have to. The public can search legislation across the horizon. So, when you’re looking at stand by our gun legislation you can see how many other states have introduced that legislation and whether word for word or phrase for phrase. Open Congress, a websitebuilt jointly with the Participatory Politics Foundation. Sunlight has since taken over Open Congress, which has over 125K+ visitors a month. The popular Congress app, meanwhile, which allows users to track legislators and bills from their smartphone, has been downloaded more than 100K times. Scout, a fantastic app for people following public policy in some direction that scrapes congressional record, Congress and half a dozen other sources and bring concerns to light. Know someone who would be an amazing Sunlight Foundation director? Now’s not the time to stop tussling with the current administration about $1.3 trillion in errors found in USASpending.gov. Ellen looks forward to easing in the new director as she transitions out at the end of 2014. “Our work has been catalytic, but has yet to be fulfilled,” she says. Code for America came out of a Transparency Camp. “We gave them their first $10,000,” says Ellen. Aside | This entry was posted in 1776, Data Transparency, entrepreneurial community, entrepreneurs, government accountability, Open data, startup grind, Uncategorized and tagged 1776dc, DC Tech, DCTech, entrepreneurs, government accountability; Sunlight Foundation; Open data; startups; foundations, Startup Grind, Washington Metro Area startups. Bookmark the permalink.